If she were still on this earth, we would be celebrating her 98th birthday today. It has been 21 years since she left us, but it is as vivid as yesterday. She was the most important woman in my life, for so many reasons. In a post I did back on her birthday in 2010 (which you can go back and view, titled A Most Special Remembrance), I cited many of the ways she made my life special. I reread that post today, and everything I talked about then is still just as important to me today. In addition to all those memories I wrote about in that post, I did fail to include a very important lesson she taught me. She always made me believe that I could do anything I really wanted to do, if I put in the talent and effort to make it happen. I know lots of moms say that to their kids, but she not only said it, she lived it. When she passed away, I gave the eulogy at her memorial service. I ended it by saying, "I hope I always make you proud." I often talk aloud to my mother, and I've repeated that phrase to her on numerous occasions. I am certain she would be proud of my published writings. I'm just sorry she didn't live to see my name in print. But there is a way I honor her memory, and give her credit for all she did to encourage my work, from the time I was young. I make sure my publisher knows that my name on the cover of any work that is mine alone always includes my maiden name, hence "Suzanne Rowe Ogren" (I also co-author with my husband sometimes, and I'm credited on those books with just "Suzanne Ogren"). Naturally, my dad is part of that legacy, too, when I use my maiden name. I know he would get a kick out of that. But he would be the first to say that my mother is the one responsible for me never giving up my dream, to pen the things I envisioned in my head, and see them published. This year, with my first novel, Ribbons, published in April, I just knew this was my birthday present to my mother for 2016. And I believe she's reading it today - and smiling! So, here it is! 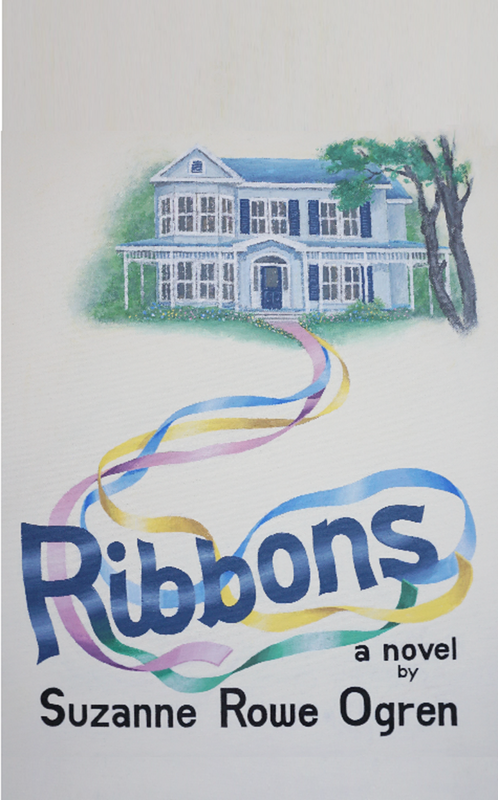 My novel: "Ribbons"! Talked about in other posts going back quite a long time, but it has finally become a reality, and I couldn't be more proud of this one! My husband did the cover art as a painting, which hangs in my study now, and I was thrilled that it transferred to the cover so perfectly. This is a character driven novel; my favorite type to read, so it was natural to write my first novel this way. The settings are a small, college town in Virginia - where we lived for ten years, and several locations in England - our second favorite place to be. You can read the synopsis, and purchase the book on the publishing website: themeparkpress.com. "Ribbons" is also available on Amazon.com and Kindle. 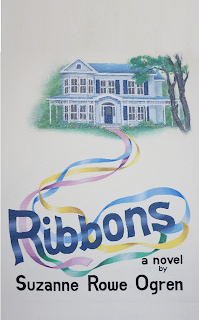 The story of "Ribbons" is one for both male and female readers, and my hope is that the characters who create the theme of this novel, are ones that will remain with you long after you finish the book. When you read it, I would love to hear your comments about it. It also helps with sales if you post a review on Amazon and/or goodreads.com. Thanks in advance for your help there! And a sincere thank you to all who supported my efforts during this long journey to print reality; you know who you are, and I am so grateful. In my life, at least, all things "planned" never seem to happen "as planned"! That is true of what I blogged back in May (how time flies!) about my blog posts and where to find them. I did post one blog on our website (www.rjogren.com), and do have plans (there's that word again!) to do others on that site, in conjunction with those my husband does. Those would be mostly about our Disney experiences. The breakdown in getting back to blogging occurred when our lives became immersed in a host of other priorities: promoting our published books - "Together in the Dream" (co-authored with R.J.) and "Ribbons" (my novel which came out in May), working on the sequel to "Together in the Dream", getting our combined website designed and up, doing podcasts and interviews, and keeping current with all our social media sites to get our books sold. But it's time to make time for this blog; my oldest, and the one where I can pretty much talk about any subject on my mind. R.J. and I have been working for the past couple of weeks to organize our days, and our priorities, so that we don't neglect certain things - like blogging! I have a list of topics I plan to blog about, either on here or on our website blog, and I hope you keep returning to see what they are. Please know, too, that we appreciate your comments on whatever our subject matter is, so please join in the conversation. And don't give up on us; we're a work in progress with new challenges!